I couldn't help it. I bought these beautiful cushions last week. They are made from vintage fabric by the very talented Irene from Re-Vintaged. Florals get me every time. I think they look fabulous on my wing back chair. Happy Monday to you all. so pretty! and it looks comfy too! Oh Simone! I love the chair...It beautiful, the cushions are so pretty!!! 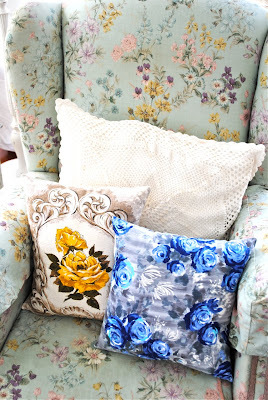 Very pretty pillows-they do look great on your chair. they both rock. but the blue one is flirting with me. i am so with you. i love pillows too....and now i want to go make a buch that will stack up somewhere and stress me out and make me excited at the same time...lol. They look so gorgeous and just perfect for that chair. Irene makes beautiful cushions and she is a lovely lady also (who has an amazing fabric collection me thinks)! Such floral fabrics make a home feel like... home ! Hi Simone, they are lovely, I am going straight to have a look for myself! They look wonderful! Thank you for the post, you are one of a kind!! Oh lovely! The only thing I'd do differently is I'd repurpose them from your chair to mine. Doesn't 'repurpose' sound much more honest than stealing...? yes simonne!! they look beautifull!!! like a touch of happiness!! !besos and happy week!!!! I Love yours projects, my friend! i love the cuscions and i love that armchair!!! THEY ARE SO CUTE AND I LOVE THE CHAIR! I love them Simone!& they do look great on that chair. oh my goodness! They are are adorable. Olala... the cushion with yellow rose is really beautiful... I just love it. I used some images off your blog of houses, it was for what I wish my house would look like. I will link to you if that is ok. I have a dress that has a very similar pattern to the blue cushion. I just love the chair!!! Sorry I'm hoping back and forth here, I'm just perusing your whole blog as I get the time. I have a very similar chair to the one you have pictured here, however it has a sunny yellow background. I love it, it's the inspiration for my entire family room. Your blog is beautiful.